Duct Tape Flowers - for Mother's Day! At least on a small scale (for now). 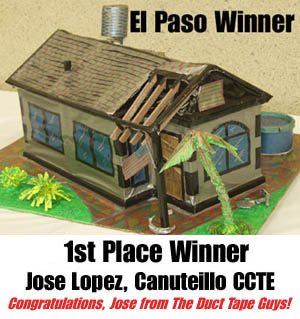 An El Paso, TX Home Show ran a duct tape house contest at area schools in conjunction with Habitat for Humanity. Tape was donated by Duck® brand. This is the winner of their contest. You can see the other creative entries by clicking here. 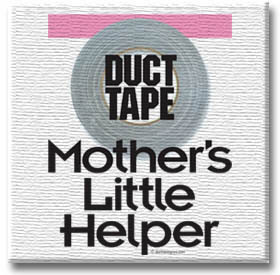 Duct Tape: Gender Neutral (Mom uses it, too!). Mother's Day is coming up on May 11th. 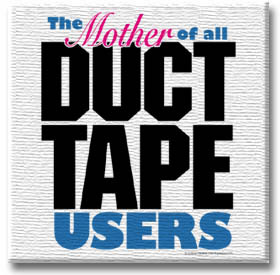 You still have time to order Mom one of our mom design shirts from the Duct Tape Pro Shop for just $17 plus shipping. While you are at it, grab our Department of Government Recommended Stockpiling of Duct Tape Special - a book three (autographed) and our video combo and $18.95 retail value for just $10.00 plus shipping. Get it all at the Duct Tape Pro Shop. Get four FREE Duct Tape Postcards from The Duct Tape Guys. Click here for more information.The free stuff on this page changes every two to three months - so keep checking back! 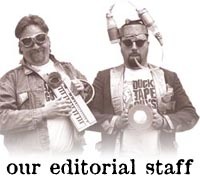 The Duct Tape Guys are looking for your short stories about how you have saved money using duct tape. Submit your savings story (100 words or less) along with an approximate amount of money saved by using duct tape, a photo of the project or repair job if you have one, your name, city/state, and email address. We will select the best stories and post them here. The top three stories will get a nice supply of Duck® brand tape and a set of our duct tape books. Deadline for submissions is May 26th. 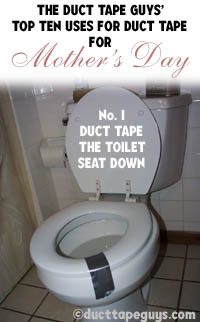 Winners will be announced in the May issue of Duct Tape: On a Roll. Click here for more information. Can Duct Tape Save the World? Hey, we need more entries for this one - or we're not gonna have any winners! Most of the responses so far have dealt with putting duct tape over a few key mouths in Washington DC. Okay - we want OTHER ideas of how duct tape can save the world. Most of you, if you subscribe to our newsletter and visit our web site, are firm believers in the power of duct tape. But, can duct tape save the world? Can it fix broken peace? Can it help foreign relations? Can it help the impoverished and diseased of the world? Can Duct Tape prevent SARS? Cartoonist Aaron McGruder again found humor in duct tape in relation to the current SARS scare. Following through on a Department of Homeland Security idea that hundreds of cartoonists picked up on (see our collection here): Duct Tape Cartoons/DHS. David Letterman (or his writers) ripped off (or thought of) this same joke two days after this cartoon appeared. STUCK AT PROM - The 3rd annual Duck® brand "Stuck at Prom" contest is underway! Click here for to see some of the previous years' entries for inspiration. There is a link to Duck® brands' entry information page. Thanks - Eric - while the current administration is in place, we can use all the help in foreign affairs that we can get! 1. Artificial intelligence is no match for natural stupidity. 2. For every action, there is an equal and opposite government program. 3. If you look like your passport picture, you probably need the trip. 4. Bills travel through the mail at twice the speed of checks. 5. Junk is something you've kept for years and throw away three weeks before you need it. 6. Eat well, stay fit, die anyway. 7. Men are from earth. Women are from earth. Deal with it. 8. A balanced diet is a cookie in each hand. 9. Opportunities always look bigger going than coming. 11. Experience is a wonderful thing. It enables you to recognize a mistake when you make it again. 12. Middle age is when broadness of the mind and narrowness of the waist change places. 7. Leave cryptic messages on the computers. 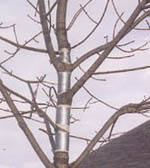 Duct tape is used by a lot of people to help their sick trees and shrubs. Sometimes birds manage to remove a piece for some next building material. If you have a duct tape sighting you'd like to share, take a photo of it and send it to us - we'll use it either in our Duct Tape Diner, or on our Duct Tape Sightings pages. Click here for submission information. Camo Jim. 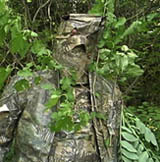 Jim wrapped himself in Duck® brand's camouflage duct tape and instantly became "The Invisible Man" - at least until he came in from the woods. Check out a similar photo of Jim photo test your creativity by writing an appropriate caption for it on our Photo Caption Contest. Click here for the current contest photo. RANDOM WINNER: The random winner of a duct tape book in this issue : Elisabeth Rush. Congratulations! Send us your mailing address and we will send you an autographed Duct Tape Book.